After competing in the Regional Challenge and the Victorian Super Challenge the Galen Year 9 & 10 team was invited to the National Grand Challenge which was held in Wangaratta. 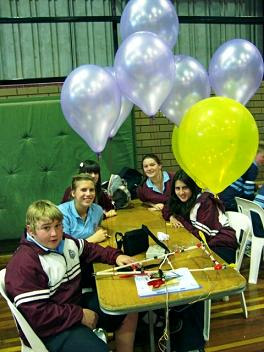 School teams from all over Australia converged on Wangaratta for 3 days of competition. Galen competed against eight other schools in the Bronze competition which was held on Tuesday . The Grand Challenge was a little bit more stressful than the previous Challenges as the students did not know which challenge they would be doing until it was pulled out of a hat on the Tuesday morning. Our students performed admirably on the day. The final activity of the day was the testing of the balsa wood bridges which was telecast live on the Web. Our bridge, built by Ben Seager, James Pond, Ben Harvey and Michael Kalkandis was the winning bridge on the day. Although we did not win the competition overall our students enjoyed the experience and were a credit to the College. Thanks to Mr Paul Benedetti for his help with all three challenges.